Without the correct amount of moisture, about 14%, popcorn will not pop. That's why it's critical that the popcorn storage method maintain this moisture content. In just one day a popcorn kernel can lose 1% of its moisture if left uncovered. This seemingly small drop will decrease the quality of the popcorn. A drop of 3% will keep the kernel from popping all together! Popcorn storage using glass or plastic airtight containers is the recommended method for maintaining the proper moisture content. These containers should be stored in a cool place, but not the refrigerator since that will cause the kernels to dry out faster. 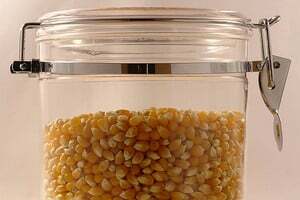 Mason jars or other glass containers are ideal for popcorn storage. Be sure that the jars are meticulously clean and dry. It is also important that the jars seal tightly. This is the best way to store the kernels. Plastic containers that have air tight lids will work well for storage. They should be inspected carefully to ensure that there are no cracks or breaks in the plastic. Be sure to check the lids for any damage as well. The other option for storing your popping corn is plastic zipper bags. Although this is the easiest way to store the kernels, it is not the most preferred way. These bags simply are not as airtight as a glass jar. Also, in the event a mouse or other creature got into your home, they could easily chew or claw through the plastic bag. After pouring the kernels into the popcorn storage container, seal it tightly. Label the container with the date that the kernels were stored. You will need to place the containers in a cool, dry place. If the storage area is too warm, the moisture will leave the kernels and they will not pop. Most people will store the popping corn in a dark basement or cabinet. Popping corn can keep for up to two years if stored properly.